The Model P590 is a general purpose commercial gauge with a light weight grey ABS case that is corrosion and weather resistant. This pressure gauge has a brass socket and phosphor bronze or beryllium cooper bourdon tube. All gauge sizes meet ASME B40.100 Grade B accuracy (±3-2-3%). 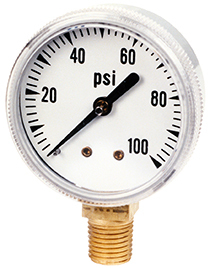 Gauge pressure ranges include 0 to 15 psi through 0 to 300 psi. These pressure gauges are available in low mount or center back connections. Gauge size: 1½" or 2"
Request more information to see how we can help you with a pressure gauge solution that fits your exact needs. To purchase this model through our webstore, please click here. Order Code: /C - NIST (National Institute of Standards and Technology) Certification of Calibration states that the pressure gauge was tested at multiple test points and is within its stated tolerance of accuracy. Gauge is shipped with a sticker on the side of the gauge noting the certification number and date, and NIST certificate. US Gauge offers most pressure ranges in dual scale, such as psi & kPa, psi & BAR, psi & kg/cm2, or single scale metric such as kPa, kg/cm2, or BAR. Dual scale dials are available at no extra charge. Please reference our data sheet or email customer service at usg.sales@ametek.com with any questions.